Today’s I/O keynote was Google in all its glory. Expansive, overly dramatic, nerdy, impressive, self-unaware, exhausting. It’s no accident that, relatively speaking, Android was nowhere to be found. Oh sure, there were the usual perfunctory activation numbers, and a new feature or two, and even a product announcement: the native Android Samsung Galaxy S4. But the S4 cost $649; only the Chrome Pixel was given away for free. Google is a web company, and the I/O keynote was about the web and web services. Music, photos, search, messaging, Google Now, maps, Google Play game services: all available on the web and/or cross-platform. Services are where Google excels, and it’s where they make their money. It’s why they make the most popular iOS apps, even as their own OS competes for phone market share. Apple, on the other hand, makes money on hardware. It’s why their services and apps only appear on their own devices; for Apple, services and apps are differentiators, not money-makers. Apple invests in software, apps, and services to the extent necessary to preserve the profit they gain from hardware. To serve another platform would be actively detrimental to their bottom line. Google, on the other hand, spreads their services to as many places as possible – every platform they serve increases their addressable market. So what about Android? I remain convinced that Android was, first and foremost, defensive. To own the bottom of the pyramid is to own access to the top, where Google’s profit lies. 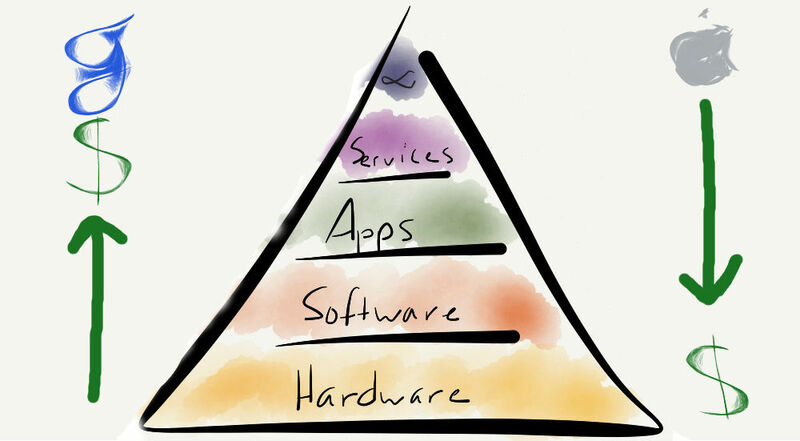 Android ensured that no one company would ever monopolize the bottom of the pyramid like Microsoft did for PCs. Most of you in this audience have lived through the PC revolution. An incredibly important revolution in our lifetime. It started around 1980, but if you take a look back, for over 25 years, most people in the world used one operating system, which was Windows. And in terms of hardware form factors, it evolved from desktops to laptops over a long period of time. This, from Google’s perspective, was a very bad thing. Windows firmly controlled the pyramid, to the detriment of web-based competitors (Hi Netscape!). But fast forward to about seven years ago. Google acquired Android in 2005 as a defense against Windows Mobile dominating smartphones just as Windows dominated PCs. When the iPhone arrived in 2007, Google quickly pivoted Android to defuse the new threat. And they were hugely successful. With the advent of smartphones. there’s been an explosion of devices. Phones and tablets and increasingly new types of devices. People are adopting these devices at an amazing pace because it has a profound impact on their daily lives…the world has changed pretty dramatically just in a span of six to seven years. And no one company controls that world, thanks to Android. We are very very fortunate at Google to have two platforms…Android, and Chrome… Android and Chrome as I said before are really designed for people to build amazing experiences on top. We at Google are working hard on top of these platforms. We call this the best of Google. We are building products like search, maps, youtube, Google Now, and many more new things that you will hear about later today. So we are working hard on top of these platforms to push the journey of computing forward.